Double-dealing employers, heavy-handed Alliance patrols and marauding Reavers are all in a day’s work for a ship’s captain at the edge of the ’Verse. As a big fan of the Firefly series and the Serenity movie (and Joss Whedon stuff in general), I was looking forward to Game Force Nine bringing the universe to the tabletop, and Firefly: The Game doesn’t disappoint. It’s a spot-on example of successfully applying licence to a boardgame and has a lot of personality, but make sure you gather the right kind of desperadoes around your gaming table, because those enamoured of manipulating wooden cubes to establish finely tuned economic systems (ie, the kind of gamers we don’t really cater for here at the EOG) will find it most definitely not up their alley. However, if you like getting into character, a heavy dose of luck, and a lot of theme, this one’s for you, and for my money is a much more enjoyable ‘pick up and deliver in space’ game than the somewhat over-fiddly Merchant of Venus. There are heaps of expansions available for the game, most of which add to the fun, especially Pirates & Bounty Hunters, Blue Sun, and Kailasa. This rules summary and reference covers them all. Oh, and there’s some overpriced ship packs and promos if you’re a completist. I agree with your comments about Firefly 100% Peter. This is a textbook example of product licensing done correctly. Really catches the core elements and flavour of the series exceptionally well, and is fun to play as well. I hope you’ll be able to add ‘Breaking Atmo’, ‘Pirates and Bounty Hunters’, and the upcoming ‘Blue Sun’ expansion to the rules summary. Possibly a word or two on the promos as well? Charitable donation sent to help make that happen. As always, my grateful thanks for your tireless efforts! The updated summary is now done and I’ll be uploading it tomorrow morning! And a review of the first two expansions will be following. Cheers and thanks Bruce! You should probably also mention the extensive collection of fan-submitted add-ons and variants over at boardgamegeek.com as well. This game has a dedicated and largely civil fan community. Having trouble with your submission button… *shrugs* must be at my end. Anyhoo, you should probably note the extensive fan community doing variants, mods, and scenarios over at boardgamegeek.com. Enjoying your site so far. Thanks for the great work. Everything alright? Your comments came through fine. Yes, it was a local LAN issue I guess. Page eventually reloaded and the double post. D’Oh! fugitives and passengers off in any sector with a planet. Where is this rule referenced in the book? I can’t find it anywhere. I knew about the “passengers at a planet” but not about parts, cargo, contraband, etc. . . I love the Firefly series, but this game is so long and boring. It tries to capture the feeling of the universe, but it just doesn’t work as a game. One that suffers from runaway leaders, luck and no catch up mechanism makes for a long time of sitting watching someone else win the game. For what this game offers, it just doesn’t deserve the insane amount of playing time. It also suffers from no interaction, and possibly the worst game for sitting and doing absolutely nothing when it is not your turn. Have you tried the Pirates & Bounty Hunters expansion? It adds a lot of player interaction and I think is an essential addition. But perhap this just isn’t the kind of game for you. I can see your point, the game can go on for a good four hours, but we found that it only tends to go slowly if you are playing with new players or you have someone who can’t help but over analyse every move. We split up some of the functions so every player has something to do even when its not their turn (banker, job card manager, upgrade card manager & full burn encounter card manager. You could even add token distribution and rules referee if you have more players) it keeps everyone engaged and since they know what they’re doing it speeds things up. Since they released the blue sun expansion, we found this made the reavers and alliance cruiser more relevant in each game and you had to consider your tactics more to avoid getting eaten/arrested. This can also help in terms of slowing down runaway leaders as you can (should) start to move the reavers towards the leading player. A couple of encounters with the reavers should slow them down significantly. Lasty the introduction of the setup cards, specifically the ones aimed directly at speeding up the game really help (one of them comes with the latest ship expansion, Esmerelda), but these are aimed at players who know what they are doing so the head start on ships/missions doesn’t cause confusion. We played with Blue Sun a few weeks ago and it was brilliant. It really upped the tension having those Reavers flying about. Strangely, this is a game that seems to get better with every expansion. Hi Peter, love the job you’re doing here at the EOG. For this one in particular I’ll have to ask you if there are any plans to publish a foam insert? Thanks! I’ve already designed and built it – just need to make the plans. Coming soon! I built one for everything apart from Kalidasa, but I couldn’t get it all in one box, too many cardboard pieces (verse boards and ship cards). So I’ve used the base box for all the tokens, ships, cards & cash and the blue sun box for all the boards, setup/story cards and rule books. Interested to see what the one here looks like. I managed to squeeze it all in, but the notes are in individual denomination piles wth brown paper bands wrapped around them. Of course that doesn’t count the new ships, which won’t fit! Any idea when the plans might be available? Love your work by the way! I just played the base game for the first time last weekend! What fun! I have to say, the reavers really love me. 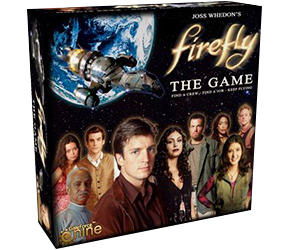 I wish they had a collectors edition which included the new 50″ x 20″ vinyl game mat (includes the planetary systems of Firefly: The Game and both its Rim Space Expansions, Blue Sun and Kalidasa). You’re right, it’s not right! Fixed.